Easter Eggers are one of our favorites. 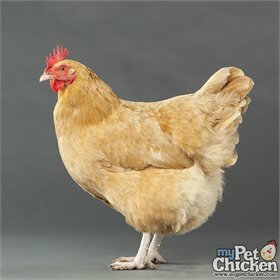 They are friendly, great layers of large eggs. 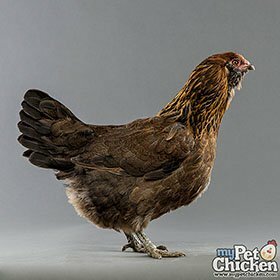 Please note that while they chiefly lay blue or green eggs, they may (rarely) lay any egg color, including tinted, white, brown or even pinkish eggs. 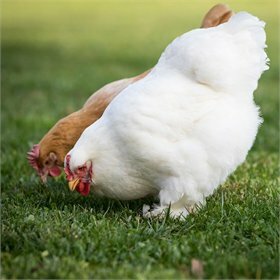 Their smaller body size makes them good in the heat, and their small pea comb means they do well in cold, too, because they are not as susceptible to frostbite. (They are often not especially good winter layers, though.) 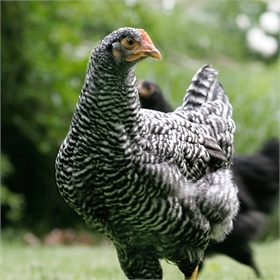 "Easter Eggers" are hybrids that carry the blue-egg gene. We like to think that the pea comb is linked not only to the blue egg laying gene, but also to the "sweetness" gene, as well. 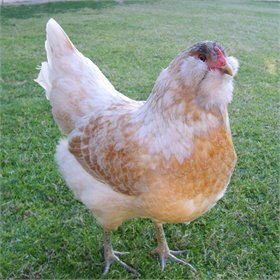 Because this is a hybrid variety (not a breed), even if you have a whole flock of them, you can often tell them apart because they come in so many different colors - which isn't always possible with other breeds.